Here is a video which is making waves on social media, which should make you peeved. A man went to a military funeral in West Palm Beach, FL over the weekend wearing US ARMY Dress Blues. He was confronted about his dress code by a couple of Marines. 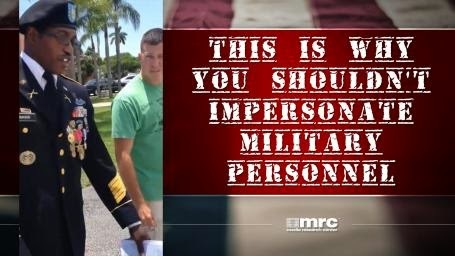 As the conversation heats up, you see that it is clear that this man who kind of resembles Wesley Snipes, is committing a federal felony by impersonating a Sergeant Major in the U.S. ARMY. "Whoever, in any place within the jurisdiction of the United States or in the Canal Zone, without authority, wears the uniform or a distinctive part thereof or anything similar to a distinctive part of the uniform of any of the armed forces of the United States, Public Health Service or any auxiliary of such, shall be fined under this title or imprisoned not more than six months, or both." "Whoever falsely represents himself or herself, verbally or in writing, to have been awarded any decoration or medal authorized by Congress for the Armed Forces of the United States, any of the service medals or badges awarded to the members of such forces, the ribbon, button, or rosette of any such badge, decoration, or medal, or any colorable imitation of such item shall be fined under this title, imprisoned not more than six months, or both." The one thing that gave it way quickly for me was how he wore his medals. It wasn't straight and neat but rather looks like it was just put on with no real uniformity. 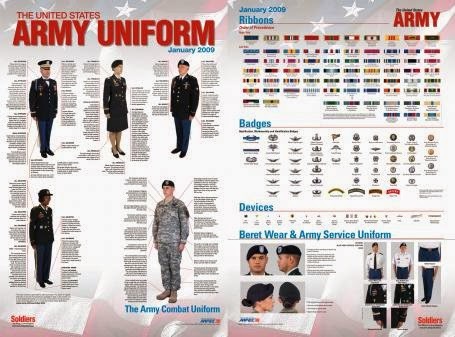 Check out the official U.S. ARMY Uniform Poster from 2009 as a reference.